Look better like this, don't they? Click on drawing to view. In the last post I was considering giving up this kind of drawing. I will never give up the ballpoint, though. Never! I love it far too much. I don't understand why everybody doesn't draw in ballpoint. It's more the doodley style thing I was thinking of putting to bed. However, I do have an idea for them, and I need to get that out of my system first. And, it's a rather large idea. After which, you'll be as bored of these kind of drawings as I am. 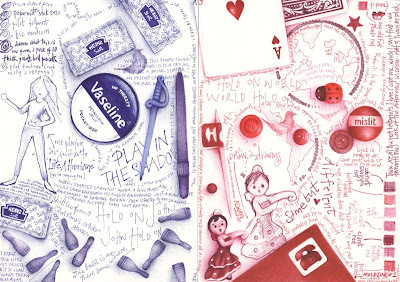 Click HERE to see more of my ballpoint drawings. I will NEVER be bored with your wonderful ballpoint pen drawings... so please as long as they feed your artistic soul continue them and share them. Your fans will LOVE them. ditto to the above. i'll never get tired of using ballpoint either. I only just found your drawings through a picture site, and I've honestly just fallen in love with them. Looking forward to more of your art. Thank you all, lovely peeps. Jenny, nope, I don't have any favourite ballpoints. As long as they are not the blotchy type I'll use them. Take a look at the post entitled 'blowing of the dust', if you can read the writing, it tells you how I feel about my lovely friend, the ballpoint pen. I started drawing with words when I was a young teen. I ventured into other slight illustration, including some for the United Nations, but NOTHING in my entire life prepared me for the wonder that I find in your work. You amaze, you startle, you draw me deeper into the quietest part of my heart—which I used to inhabit when I drew. You are a complete inspiration, and I thank you for your art. Sending gratitude from Soquel (near Santa Cruz) California. Hard to be bored with these, Andrea! Just do a variety of things, then you never get bored! The one problem with ballpoint, that I've heard of, is that they are not colourfast, so could fade away, especially when exposed to sunlight. I love your work - doodling is one of my favourite types of art, although I seem to have a hard time drawing the drawings out of my imagination. Your work gives me hope! :) Love it, keep doodling! The first time I saw your sketches, I was totally inspired to start sketching with ballpoint pen. However, when i tried it, it turns out bad and very messy. I really would like to see how you actually do it, may be you can post some videos of you sketching? or some tutorials? I really would like to learn from you because you are so great haha...keep it up! Dian, I have something in mind - tutorial wise. I have just come across your blog via a new cantact and was immediately attracted to your fabulous sketch book. Now tell me had you been watching the documentry about John Lennon? (Hold on John) And anyone who plays air guitar to 'Like a Hurricane' has to be OK!! I bet you can play the hell out of that air guitar! that's funny!